March 24 Update: The 84.7" Minneapolis seasonal snowfall to date is confirmed. Midnight CDT Update: An unofficially final amount of 4.1" for March 23 leaves the Minneapolis seasonal snowfall total at 84.7", still in 5th place, but just 0.2" behind 1916-17. 5 PM CDT Update: Snow ended at 4:08 pm with only a trace of precipitation since 1:00, so the total of 84.6" is likely to hold. 3 PM CDT Update: An additional 1" which had apparently been recorded earlier raises the total to 84.6", putting the seasonal snowfall in 5th place if confirmed. Further accumulation of up to 1" is forecast through 7 pm. An amount of 0.4" or more would be enough to reach 4th place. Minneapolis is reporting 3" of snow in the last 6 hours as of 1 pm CDT. Combined with the 0.4" reported yesterday, this brings the seasonal total unofficially to 83.6". That amount would put this season in 6th place, behind the 1991-1992 amount of 84.1". Light snow is continuing, although visibility has increased substantially during the past hour. RECORD OF 4.74 INCHES RECORDED ON MARCH 15TH 2003. JANUARY 26TH 1956...WHEN 5.96 INCHES OF RAIN WAS REPORTED. RECORDED. THE PREVIOUS RECORD WAS 1.20 INCHES...SET MARCH 7TH 1952. 1993...WHEN 3.38 INCHES OF RAIN WAS REPORTED. FELL...AND MARCH 1ST 1983 ON WHICH 2.55 INCHES OF RAIN FELL. In the San Diego area, the 1.09" at Fullerton broke the record of 0.95" set in 1954. HUNDRED YEARS AGO IN 1893. 20TH OF 0.87 INCHES WHICH OCCURRED IN 1973. 1.27 INCHES IN HANFORD...AND 1.41 INCHES IN MADERA. In the San Francisco Bay area, Salinas set a new record of 0.97", doubling the old record of 0.48" in 2006. Salinas climate records began in 1930. The strong Pacific storm pounding Southern California on Sunday is setting at least one all-time rainfall record. 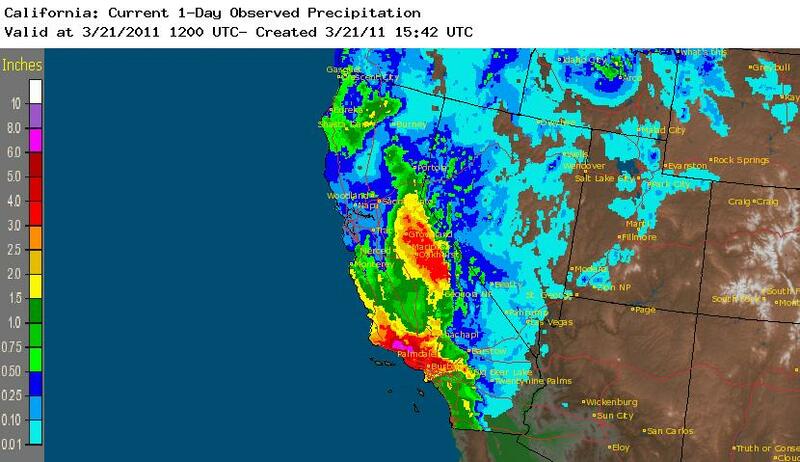 The Weather Channel twitches that the all-time daily rainfall record at Santa Barbara Municipal Airport (KSBA) is 4.74" on 3/15/2003. The 4.59" reported through 6 pm local time has been augmented by 4 more consecutive hours of rainfall, resulting in an unofficial total through 10 pm of 5.24". This not only smashes the all-time record by half an inch, but it's also nearly 6 times the old March 20 daily record of 0.90" in 1991. Normal precipitation for the entire month of March in Santa Barbara is 3.59"; climate records began in 1941. Both Los Angeles airport (KLAX) and downtown (KCQT) had set daily records by 6 pm. The airport has received at least half an inch of additional rainfall since that time, and downtown has added about 0.8". Update to be posted when final amounts are available.